Have you heard of eosinophilic oesophagitis (EoE)? This condition is thought to affect 1/100 adults and 1/10,000 children and it appears to be on the rise. Moreover, it is challenging to diagnose and may be misdiagnosed, or simply overlooked altogether. 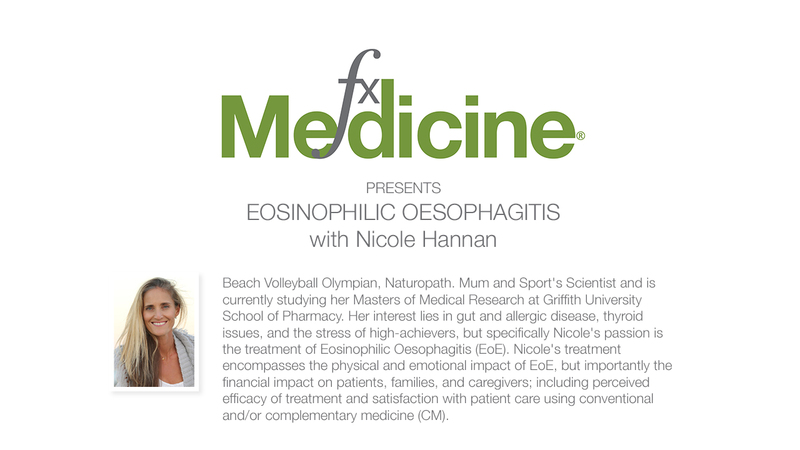 Navigating the world of EoE with her own daughter, naturopath, sports scientist and former Olympian, Nicole Hannan has become a crusader to raise awareness about this confounding condition. 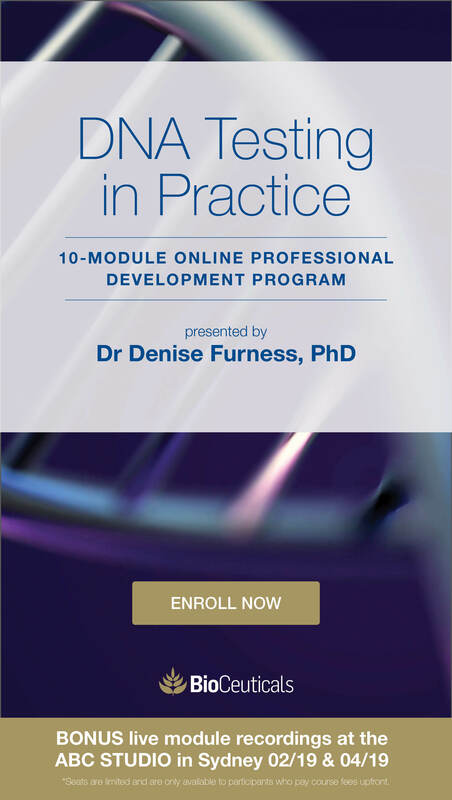 Through her personal experiences of working with her daughter's difficult digestive issues, Nicole hopes to help others recognise and implement workable, safe strategies for the many health issues those with EoE present with. [08:22] What is the prevalence of EoE? [15:15] Presenting signs and symptoms? [22:17] How is a diagnosis reached? [43:42] What about natural treatments? [48:09] Resources for further learning? Andrew: This is FX Medicine, I'm Andrew Whitfield-Cook. Joining me on the line today is beach volleyball Olympian, naturopath, mum, and sports scientist, Nicole Hannan, who is currently also studying her Master's of medical research at Griffith University's School of Pharmacy. In other words, she has no life. Her interest lies in not just gut and allergic disease, but also thyroid issues and interestingly the stress of high achievers. But specifically, Nicole's passion is the treatment of eosinophilic oesophagitis, EoE. Nicole's treatment encompasses the physical and emotional impact of EoE but importantly the financial impact rallied on patients, families, and caregivers. Including perceived efficacy of treatment and satisfaction with patient care using both conventional and complementary medicines. Welcome to FX Medicine, Nicole. How are you? Nicole: I'm very well. Thank you so much for having me. And congratulations on saying ‘eosinophilic oesophagitis’ without even a hitch. Andrew: Yeah, yeah. Yeah, five hours of practice beforehand don't worry about that. Nicole: EoE is much easier. Andrew: EoE is a heck of a lot easier. Once you know about this term...I knew nothing about this term a month ago. But you've got a very interesting career. Before we delve into EOE and its treatment, can you tell our listeners first about where you started and where your interest in natural medicines began? Nicole: Okay. So, I guess you mentioned it in my introduction. I was an athlete for a long time. I played beach volleyball for Australia for many years; I won't say how many because that will make me sound really old. And during that time, I was always really interested in natural therapies, and I had been since I was a kid really. My grandparents and parents have all had an interest in natural therapies. So, I went from beach volleyball and started my training as a naturopath while I was still competing, and I had an injury. And it just went from there really. And then I had a break when I had my daughter, and my daughter actually has EoE. And so that's where my interest came with EoE; obviously living quite a crazy journey of parenthood that wasn't as expected. Interestingly enough I loved working with allergy and gut before I had my daughter, and so she sort of came to the perfect mum I think. And I ended up learning about this disease that I'd never heard of before. Nicole: When she was first diagnosed, we just got told, "Oh, it's EoE. You know, just Google it. It's like asthma of the oesophagus. Go ahead and... She'll be right sort of thing.” And, once we learned a bit more about it, we realized that that is absolutely not the case, and it's quite a crazy disease to have to live with. And I guess my aim now, with my career, is to use the knowledge I have as a naturopath. And as a mum having lived, this last almost eight years of experience, with this disease and having made so many contacts and helped so many other people is to just do further research, because there's not enough known about this and not enough people are aware of this disease. So, where I'm looking at finishing my Master's hopefully next year, and then if all goes to plan and I don't go insane from the research side of things, then my aim is to look further into a PhD and do more research. And hopefully that will end up with clinical trials with some natural therapies and interventions to help people who are living with this condition. Andrew: Well, I've got to say not just because of need but also your acumen to, or your ability to make complex points crystal clear. You recently won the award for the best talk at the NHAA Conference in Australia. That's the Naturopaths & Herbalists Association of Australia, NHAA. So well done on that. And I've got to say that's an amazing, clear talk. Very well done. Nicole: Thank you. Thank you very much. It was from the heart. I think when things are from the heart, you really want to get your point across. It was really fun putting that all together because it's a message that I've been wanting to get across to practitioners for a very long time and it was amazing. It was really such a great experience to be able to get up there and share the story and help other people to understand this disease. Andrew: So, I've got to then ask the question, what is eosinophilic oesophagitis? What's its pathologic process? Nicole: Okay. EoE is a chronic, antigen-driven inflammatory gastrointestinal disorder. So, basically the esophagus is only one type of eosinophilic disorder. So as a whole, they're known as eosinophilic gastrointestinal disorders. And depending on what part of their gastrointestinal tract they affect, that will be the name of the disease. So eosinophilic esophagitis obviously affects the oesophagus. You can have eosinophilic gastritis; so it affects the stomach. Duodenitis, colitis, etc. So, the oesophagus is the most common form of this disease, and a lot of people do have more than one. And when they do have that, it's called eosinophilic gastroenteritis. Wow. Andrew: Right, how does that differ though from true autoimmune...? Nicole: Yes, so lots of tongue twisters there. Andrew: Sorry to cut you off. Andrew: How does that differ though from true autoimmune disease? Like, when do you start to look into or diagnose or get the diagnosis of an autoimmune condition. Like Crohn's? Nicole: So, EoE is not an autoimmune disease. Nicole: It is an antigen-driven inflammatory disease. The antigens can be many. It can be one or it can be many. Nicole: It can be food. It can be chemical. It can be environmental. And environmental triggers are very common. But food is the most common. Ninety percent of people who have EoE clear up with a specific type of elimination diet. It's the other 10% that have issues with the chemical and the environmental triggers, or that diet hasn't covered everything. But I think that my personal feeling is that that number's probably going to change because I think a lot more people are getting a lot more sensitive, so I think down the track we're probably not going to be looking at a 90% remission rate just from a top 8 elimination diet. But I guess we can get to that later on. Andrew: So, what's the prevalence at the moment? What's it purported to be? And is that correct or is it just underreported? Nicole: That's sort of a can of worms I guess to open. The prevalence is stated differently everywhere. Like, all the research I read, there are different numbers as to what they're saying the prevalence is. The most common that I have found is...about 10 years ago, they were saying it was about 1 in 10,000. Now they're saying it's between...sorry, it was 1 to 4 in 10,000, and now we're looking at about 1 in 2,000 in a lot of the literature that I've looked at. But, having said that, some are actually reporting it as high as 1.1% to 2% of the population, which is alarming. Nicole: And I don't know how accurate that one is. But even though it could be close to that is quite alarming. And I think I had mentioned to you before that, in Crohn's disease, there was a study that tested… did biopsies of the oesophagus for Crohn's disease patients, and they found that 10% of people with Crohn's disease also had eosinophilic esophagitis when they were looking for it. And these weren't people that were necessarily exhibiting symptoms. Andrew: Yep. So what are the major presenting symptoms and how would they differently manifest if it's an antigen-driven inflammatory disease from multiple causations? Do you get a wide variation of presentations depending on, you know, whether they're sensitive to food or environmental issues? Nicole: You do, you do. Absolutely. So, I guess I should go back, and I don't think I properly answered your question before, but I think the important think to know is that the main pathophysiological mechanism here is that, when exposed to an antigen, the body sends masses of eosinophils to the gastrointestinal tract. Nicole: And so what we're looking at is big clumps of eosinophils in the mucosa of the gastrointestinal tract, and in EoE, it's in the oesophagus. Andrew: Okay. So what about etiological factors and comorbidities with EoE? Nicole: So, EoE is more common in males, and that's shown every study I've ever read. And they don't know why. It has a very strong genetic or familial association. 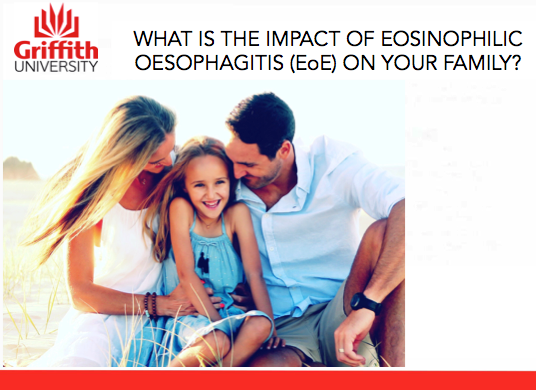 So around 10% of parents of EoE patients have a history of some sort of esophageal restructuring of the esophagus. And in those who have been biopsied, about 8% of them have biopsy-proven EoE. So there is a strong familial theme there. This is interesting. In siblings with EoE...so, if you have two children and one of them has a diagnosed case of EoE, that other child is 80 times more likely to have EoE. Nicole: And I see it very often off these siblings who are diagnosed. And actually remind me to tell you about the reactions with that later on because that's quite an interesting one. Andrew: Okay. Are we talking about a dominant trait then here? Nicole: They don't know exactly. They haven't isolated exactly what it is. Nicole: But they know that there is a very strong genetic likelihood of having EoE if you have a family member who has EoE. And it's very common in atopic families. Nicole: So, if you have an atopic disease, then you are much more likely to have EoE. So if you have asthma, eczema, if you do have those symptoms and then you are displaying the symptoms of EoE, it's very much worthwhile getting checked because you've got a much higher chance of having it if you have an atopic disease. Nicole: Yeah, it's a hallmark of eosinophilic oesophagitis. It's actually part of the...sorry, reflux in itself is a big part of the diagnosis. Nicole: Yeah, and I'll talk about how we get diagnosed a little bit later. 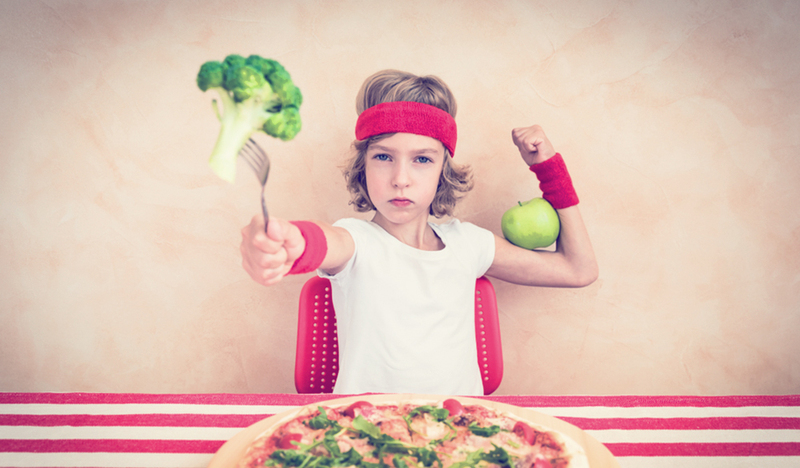 Multiple food protein intolerance is really, really common in children who have this. So, often we'll be seeing babies who are exhibiting those protein intolerance symptoms, and then it's often not until they grow out of those food protein intolerances that you'll see what the real EoE reactions are. Nicole: And I can go into more about that if you like when we talk about the symptoms. Nicole: FPIES. Have you heard of this one? It's food protein-induced enterocolitis syndrome. Nicole: This is quite strongly linked with that food protein intolerance but a bit more I guess serious or there's a few more quite sinister symptoms that come along with that. Mast cell activation disorder or mast cell disease, mast cell activation syndrome, mastocytosis, these, while they're not common diseases, they are more common in people who have EoE, than they are in the general population. And connective tissue disease is also. So, things like Ehlers-Danlos syndrome is seen in a high proportion in EoE patients. There’s also a higher risk of your autoimmune disorders. So, you did ask me about that before. Well, EoE itself is not an autoimmune disorder, ulcerative colitis, systemic sclerosis, MS are all higher in EoE patients. And there is also a higher genetic predisposition for coeliac, Crohn's, rheumatoid arthritis. Nicole: A child with EoE or is actually genetics? Andrew: So let's talk about the presenting symptoms and how differently, A) do they manifest in different patients and, B) what's different about EoE? How would you suspect EoE? What would alert you to say it's EoE rather than, for instance, just reflux? Nicole: Okay. And I think this is where it's murky, and that's why it's so exciting to be able to get this information out to people. Because EoE, when we look at the management of it, is very different to what we would do in people who are presenting with reflux or babies who are just, you know, colicky and yet they can sometimes present in a similar fashion. So, this disease presents differently in different age groups. So, in infants, we're looking at severe reflux, generally. And that can be a silent reflux. But in my experience, it's more so babies that just don't stop throwing up, so the vomiting, the food refusal, failure to thrive is huge, and signs of epigastric pain. So these are the babies are vomiting, they're obviously in pain. Generally they're not sleeping well. Andrew: Pulling up their legs. Nicole: They're just stressed all the time. Yeah, and failure to thrive, while it is a very, very common symptom and is the most common, I had seen a number of EoE babies who look well and healthy and are putting on weight, and they get dismissed because they look well. And so don't just jump across that one and think it's not EoE because they are thriving. If they're exhibiting the other symptoms, you still need to consider this as a differential diagnosis. Nicole: Pulling their legs up. Andrew: ...pulling their legs up, yeah. Nicole: Yeah, pulling their legs up and just being distressed. Nicole: Yes, yes. And, a lot of them will claw at their chest because they're trying to get to their oesophagus because that's where the pain is. Nicole: So I've seen babies who have like, drawn blood and pulled skin off their chests because they're trying to get the pain to go away. And I know it's just heartbreaking, and I probably can't think about it too much because I'll get teary. Andrew: No, well, we'll both have a cry. Nicole: I know, I know. Yes, thankfully I'm far enough past that as a mum that, you know, I'm not living that at the moment, but it is awful for parents and obviously the child going through that. So, when you get past that sort of toddler stage and you're looking at...this is when we get past that multiple food protein intolerance. I'm talking about between about three and five years old, you're looking at still having the reflux issue, heartburn, vomiting, abdominal pain, and dysphagia. So this is when the difficulty swallowing comes in. And that is a very common sign in EoE that is not diagnosed. Because of the oesophageal damage, they'll start to get some furrowing or some strictures, concentric rings as they get older. And that difficulty of swallowing becomes a big issue if it's not dealt with properly. Andrew: Now can I just ask? In a three to five-year-old, they're not very adept at necessarily isolating exactly where an issue is all the time. Andrew: So, what do they say? What do they complain of when they're experiencing dysphagia? Nicole: It's interesting, you know, because although it is in the oesophagus, more often than not the complaint I hear is, "My tummy hurts." Nicole: So, stomach pains are one of the worst things. They do say that they have a sore throat, and sometimes things will get stuck, but tummy pain is one of the most common. And also leg pain, restless legs, aching legs, they can be a really big ones. And nausea. So when they're getting that, to that age that "I feel sick," or they'll say, "I have sickies in my throat," or, "I feel burning in my throat from the reflux." And they'll have tummy pain. And actually…. Andrew: Is there a time limit after meal that it tends to present or can it be any time? Nicole: Oh, gosh. No, that's a whole big story I need to tell you. But, I just wanted to tell you two more things before I forget them. Hiccups are a really, really big sign. And this has to do with the reflux, I believe. But every single EoE child and adult that I've dealt with has issues with hiccups, and it can be from birth. And the other thing is they want to drink water all the time when they're eating. So I think it's just to help them to be able to swallow when this difficulty swallowing, dysphagia, comes along. They just always want to drink water. They need to drink something while they're eating. Nicole: So, if you're seeing all of these signs and you're seeing they need to drink water all the time, which is, I think I've seen that close to 100% of the people I've dealt with who has this. And then as they get older, in adults, we're looking at food impaction and dysphagia are the main symptoms. And reflux is also a symptom. But because this is a new disease and we're only just starting to diagnose it commonly, I think that there are a lot of adults who are now being diagnosed who've had all of these symptoms through their whole life but they’re only just now getting diagnosed. So, the dysphagia and the food impaction is probably from a lifetime of mis-management that’s caused all the damage to the oesophagus. And now they’ve got such big changes in that esophagus, that the food is getting stuck. So they’ve probably got the concentric rings and the structures and the furrows. Nicole: That are causing the food impact impaction. Nicole: No, no, no. In the oesophagus. Dysphagia and food impaction in the oesophagus. And, now, you asked me about the reaction and what the time frame is there? So, it can be as quickly as ten minutes, or it can take 10days. Nicole: Yeah. So it’s so hard to work out what’s going on. And when we talk about how we manage this, I’ll go into a little bit about the time frames of trialing things. Andrew: Given then that there’s a massive variation and delay of symptomatology from the culprit food, let's say. How does one begin to even suspect, let alone diagnose it? And how do you diagnose it? Nicole: Generally the people who are suffering these EoE symptoms… it's not generally "I'm just not feeling very well" sort of disease. And when you do get triggered, it's almost always quite a severe sort of reaction if you've had a decent amount of exposure to that antigen. So, I find that the people who are getting diagnosed, they are seeking help and no one's able to give it to them. And that is where we were at when my daughter was little, and that's why I've gone into trying to help people. The diagnostic technique is invasive. The only way to diagnose an eosinophilic gastrointestinal disorder is by biopsy. So you need to be scoped, oesophageal biopsy, and the result has to be 15 or more eosinophils per high-powered field that's non-responsive to proton pump inhibitor therapy. Nicole: So, you have to have been on a PPI and prove that it hasn't worked for it to be diagnosed as EoE. Whereas if you haven't been on a PPI to begin with, they would just say you have high levels of eosinophils in your esophagus without knowing whether it's responsive to PPI. There’s actually… Now this one's a really big mouthful, so let's see if I can say this without stumbling on my words. There is another disease state, a new disease state, that's called proton-pump inhibitor-responsive oesophageal eosinophilia. Nicole: Yeah, so PPI-responsive oesophageal eosinophilia. Yeah. Which is a completely different disease state to EoE. So, very similar but it is responsive to PPI therapy. So it will present the same but PPIs will totally put it into remission. Andrew: So, what about differential from things like pyloric stenosis and atresia’s and things like that? In infants. I guess where I'm coming from here is, where are you getting the fussing infant who projectile vomits, how do you tell that it's EoE? When do you suspect that it might be EoE versus other conditions? Nicole: So, I guess what I'll go from is my clinical experience here. And I see, when it's an infant, generally the parents have been pushed from pillar to post, and no one can answer their questions, and everyone says, "You've just got a fussy baby. Put them on some PPIs. They've just got reflux." But then the difference is these parents are distraught because the baby is more often than not extremely distressed, has the vomiting, the reflux, the stomach pains. And what I didn't mentioned before is bowel motions; more often than not, loose. Generally mucus, a lot of mucus is quite common. Not always the case, but common. And in the very severe cases, you'll also be seeing blood in the stool. Nicole: And generally, with those patients, there is a bit more, I guess there's a bit more there’s acceptance that's something's wrong from the people that they've seen before. When it's not quite that, as severe, that's probably the people that naturopaths are going to see. People will say my baby's fussy and no one can tell me what's wrong. Nicole: And so what I do is always take a really good family history, so we need to ask about siblings. We need to ask about parents. And quite often they'll say, "Oh, well, actually my husband has trouble swallowing things," or there'll be other stories that make you suspect, "Okay, this could be EoE." 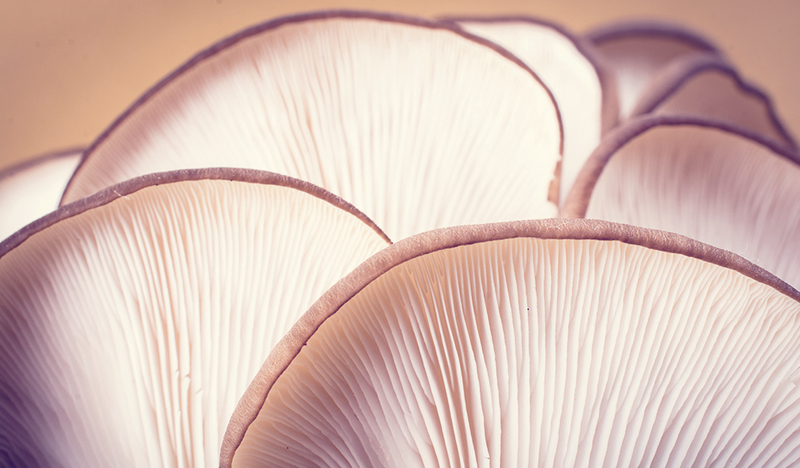 Nicole: When I spoke about the different types of eosinophilic gastrointestinal disorders, you have to also keep in mind that it might not be just a difficulty swallowing. 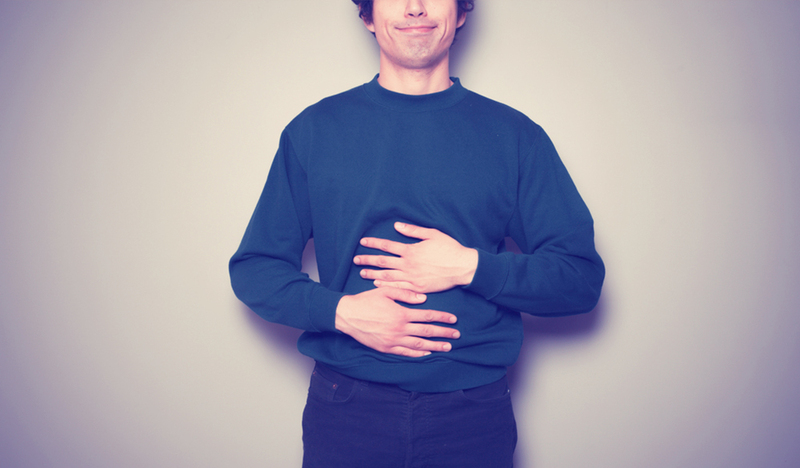 You might just have another family member presenting with lower down gastrointestinal symptoms that seem to be antigen-driven. Because you might have one sibling with EoE and another sibling with eosinophilic colitis. Nicole: So the symptoms would be different. Or a parent with one or the other. So, you sort of need to think a bit broad about it and then bring it back. Andrew: Okay, so you've gotten a positive diagnosis. You now know that it's EoE. I would suspect that you'd...within EoE, you've got a vast variance of presentations obviously as we've discussed. But also what they react to, is that right? Nicole: Oh, yes. Yes, definitely. So, presentation is going to depend on how few or how many things that people are reacting to and whether they're exposed to it obviously. The more minor, they might just have, say...you know, eggs might be the thing they react to, or milk might be the thing they react to. And those are the adults I think, who just get diagnosed really late in life because they go, "Oh, I've just always felt funny when I have eggs and so I stopped having them." And then they might have brought it back into their diet and they get the symptoms again. Nicole: So, with the antigens, you could have just one thing or you could react to chemicals, foods, environmentals, and those are the really severe cases. And it's trying to work out what on Earth they're reacting to and get them out. Nicole: And so you asked me about siblings. Yes, so that's what I was going to touch on before. So I have seen many times in families, specifically in siblings, I've seen one child who...they might both be severe cases of EoE, and you might have one child who only has three or four foods, and one of those foods is rice. But the sibling, rice might be the thing that they react to the most. So, it's very individual. Nicole: It's very, very individual. Andrew: Even given the same family diagnosis, oh, my God. Nicole: Yeah, you may have... And that's sort of an important point to touch on is there's really no rhyme or reason to what people react to with this disease. And, I've learnt to sort of...although I do work a lot with people who have food chemical sensitivities. You know, I look at salicylates, and I look at amines and histamines, and glutamates. I find that, with EoE, it all needs to be just thrown out the window. And sometimes I'll start with that if I don't have an EoE diagnosis, or I just have a child that's not quite right. But when I start looking at EoE, you need to just go, "All right, what's going to be the biggest win with what we're going to try here?" Because I've seen people who have the worst reactions to all the things that as naturopaths we get taught are the lowest reactive foods. Like pear, and rice, and all those things that, "Oh, no one's going to react to those. They'll be fine." But then you might see… my daughter for example, she was that baby. She reacted so terribly to pear, and to rice, and to apple, and everything until she was two. Nicole: But then the foods that she got first...avocado is one of them, and mango is one of them. And they're things that, you know, are highly reactive for a lot of people who are sensitive. So, yeah, you really need to sort of put a different hat on when you're looking at these patients. Nicole: Because it's not going to fit in the box that you expect it to fit in. Andrew: So I think you're going to need practitioners who want to learn about this. It almost is really taking off your dogmas, putting them in a box right beside your table, and putting on your detective hat. And saying, "I am now Sherlock Holmes." Andrew: And what might seem miniscule in patient A could be the biggest win in patient B. It just seems like everything can be topsy-turvy. Nicole: Exactly, exactly. And it's sometimes very, very hard to work out what's going on especially when they have a lot of things that they react to. And that’s why, you know, I think we spoke about...maybe we'll talk about the diet, like, the food elimination thing, one of the biggest ways to work through this. Andrew: Yeah, so this is what I was going to ask you about. 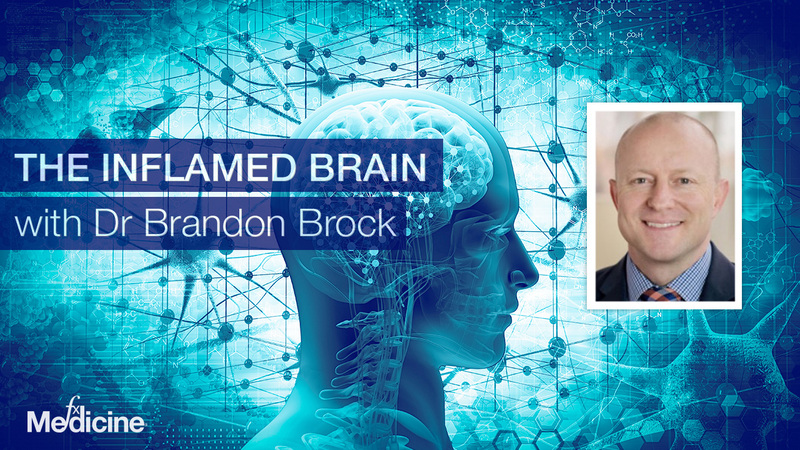 What is the standard medical treatment and how effective is it given that it's a topsy-turvy disease that can react to so many different things? Even within a family, I could understand there's no standard treatment. Nicole: Well, if we look at medical treatments...so let me just tell you what the pharmaceutical interventions are. Nicole: So, the main pharmaceutical intervention is PPI obviously because that's the hallmark of EoE is the reflux. So, we're looking at PPIs, H2 antagonists, so Zantac (ranitidine). We're also looking at budesonide oral suspension, so this is what’s also known as a Pulmicort slurry. We're looking at the steroids so the fluticasone so that's Flixotide or Flovent. Then in the more severe cases... Oh sorry, I'll just tell you about that. So when I say swallowed...so it's an inhaler like an asthma pump, and what they do is rather than breathe in when it's squirted into the mouth, they actually swallow it. Nicole: So you breathe it and you swallow it rather than inhale it, so you're spray it in the mouth and swallow it so it hits the oesophagus. Andrew: Got you, right, right, right. Nicole: And with the Pulmicort slurry, that is one that they...the doctor who invented this Pulmicort slurry decided that mixing it with Splenda was a really good idea. And so they mixed the Splenda with the Pulmicort and swallow it so it's viscous and it adheres to the oesophagus. Andrew: Do we want to talk about this? Andrew: So you just said a pear sauce, and that you said like your daughter reacted to pears. So…? Nicole: Yeah, so you would have to use what was safe for that person. So, yeah, you have to find what was safe for them, and if nothing were safe, yes, that's...you just have to find something. So if they have one safe food, you have to try and put it in the food and see if you could get it to adhere, get it to like, a consistency to adhere it to the oesophagus on the way down. Andrew: I know this is backtracking a little bit, but I'm thinking about...she's an old colleague. She went on to do medicine after doing naturopathy. And as a project, which I think remains unfinished because of funding issues, her project if you like, was eosinophilic asthma. Now I'm just seeing so many overlaps here. Nicole: Yeah. Well, interestingly the medications that are used for EoE are asthma medications. Nicole: Because… Yeah, yeah, exactly. At this stage, there are no medications that are specifically for EoE. 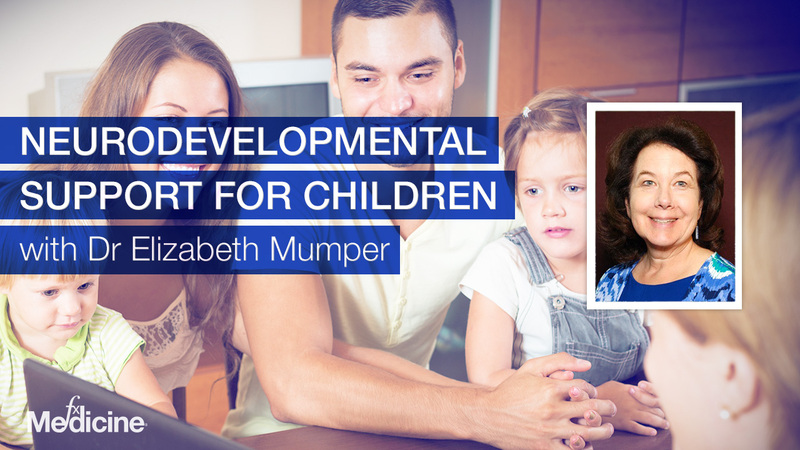 We don't understand the disease process enough to be able to develop something. There's lots of trials going on in the United States. In Cincinnati at the Cincinnati Children's Hospital, there is a centre for eosinophilic disorders, and they do the most research than anyone in the world. So, I want to go over there and check it out and talk to everyone. Hopefully one day. But, yeah, they are doing a lot of that sort of research so it's more about the pathophysiology. It's about looking at how to treat it, and find an appropriate treatment that is just for EoE and very specific for EoE. But with other treatments, the other things that they are using at the moment, are mast cell stabilisers, because often anaphylaxis is a comorbidity; you know, the atopic diseases that we were talking about earlier. So ketotifen is a mast cell stabiliser. Cromolyn sodium or Nalcrom. It used to be called Intal spin caps. But then that was actually taken off the Australian market and now it needs to be compounded as cromolyn sodium. Andrew: I remember Intal spin caps for asthma in this...it was almost like an old honking horn. Andrew: And you had this vicious need that would go up inside and pierce the capsule from one end to the other, and then you'd inhale the Intal up through your nose. Nicole: So this were Intal spin caps that weren't...now they'll put I into a baby's bottle. Nicole: Yeah, so they swallow it. So that's the main medications that are being used. And with the food side of things, in terms of treatment. There's a top 8 elimination diet, and that's the one I mentioned before that I have been trying to have a 90% remission rate for EoE when people stick to a strict top 8 elimination diet. But like I said, I am not convinced that that 90%, outside of clinical trials, is necessarily accurate. Because I think people are reacting to a lot more than just what's in the top 8. Nicole: For the more severe cases. Nicole: So the top 8 I'm sure most people know, it's sometimes referred to as top 6 as well. It's the same thing. They just term things differently within that eight. So it’s milk, eggs, wheat, fish, peanuts, tree nuts, soy, and shellfish is what the top 8 consists of. And then there's also the RPAH elimination diet which a lot of people with EoE do follow and get varied success with. So that's low chemicals, salicylates, amines, glutamates. And like I said, you know, I haven't seen the be all and end all, and it does help some people. But I'm not convinced that it's purely because of the chemicals. I think it's more because you're eliminating a lot of the foods that they were reacting to regardless of the chemical content. Nicole: Does that make sense? Nicole: Because RPAH elimination diet is, it's very full-on. There's a lot of things taken out, so I think it's really...you know, you're taking out pretty much most of your top 8 and then you're doing the low-chemical as well. The main thing for infants especially and for children is the elemental formula. And like I said in a lot of people that you are going to see in clinical...naturopaths will see in clinic, you're probably going to see the more severe cases, and these are people who are at their wits end. And, they're probably having reactions to multiple, multiple foods. And so at that point...and a lot of them will also have that multiple food protein intolerance so they will be advised to go on an elemental formula. And if you're seeing a very severe case of this and there's failure to thrive, what I really urge you to do is although the elemental formula, when you look at what's in it will horrify you from your naturopath perspective, you need to remember that this is like, you know, meat and three veg. It has everything in there that a human being needs to survive if it's taken in the right doses. Nicole: “…While we help to heal their gut. While we get them well enough to be able to have enough food to then get off the formula." Nicole: And it's really important to be able to do that. To be able to say that this is not a quick.., this is definitely not going to be a quick fix. It's going to be long-term. And if you can be patient and do things without time to just pull it right out from under them, you'll get really great results with a lot of patients. Andrew: Well done. I've got to say though that's going to require not just your true Sherlock Holmes detective hat but a true dedication to uncovering what's going on in these sorts of patients. So well done to you, I've got to say. Nicole: Thank you, thank you. Andrew: So with regards to elemental formulas, are there some that work better than others? I know that seems like tarring everything with the same brush, but do you find a variance? And I guess where I'm going here is this; I don't know if this was the case, because I never got the diagnosis. All I heard was ‘failure to thrive.’ I just heard some years ago of a naturopath who was getting amazing results with a particular child who just could not tolerate the totally synthesised elemental formula. Nicole: So there's a hydrolysed rice-based formula that is on the market now. I think it only came out last year. That may work for some people, but it is not a free amino acid-based formula, which is what the other elemental formulas are. So there are a number of other elemental formulas. There's at least 10 or 15 that I know of in Australia. And they all have slightly different ingredients so it's really a matter of trying to work through which one is the best for the individual because they're all different. Andrew: I guess where I was going there is, with regards to proteins, if you do have a totally synthesised formula and you have that thing that happens where allergies can be mediated by a hapten, like a non-protein mediator, do you get people reacting to the elemental formulas? Nicole: People definitely react to the elemental formulas. Nicole: And I'm not sure if that's the mechanism. But I do know that, because of slightly different ingredients, so some of them might have more...they might have some soy, others might be corn, others might have coconut. And it's going to depend on that. And so I always think that it's more that side of what's going on as to whether they react to the individual formulas. Nicole: But, the concentration of the formulas can cause reactions in itself as well. But I think I won’t go into that because we’re getting short on time. That's a long explanation. Andrew: So what about things like natural treatments? What's available and how well do they work? Nicole: There are no natural treatments or pharmaceutical treatments indicated for EoE. So there's nothing that's proven that, if you have EoE, this is the thing that will work for you. I have worked out a number of different things that work from a naturopathic perspective. But while I say that, they may work for one person and cause enormous, tremendous, horrible reaction in another person. So, I'm really hesitant to list specific things because I'm also very particular about which brand of things I use because there might be slightly different ingredients and how I go about it. Nicole: ...Because as you can imagine, it could do a lot of damage to a lot of people. Andrew: Yeah, cause a lot of heartache. Yep, absolutely agree with you. No problems, Nicole. What about the long-term effects of EoE and indeed, you know, the prognosis? Is there any risk of sinister things happening in the future? Nicole: So long-term, this isn't a disease that there is a cure for. You can go into remission if it's managed well, if the allergens are removed, and you can identify the allergen. Or if you use pharmaceutical medications that can get some people into remission. So, it is, at this stage, a lifelong disease. And the consequences of that are, if it is not managed well, you can get a lot of damage to the esophagus. Which can have, you know, as you can imagine, big carry on effects. If there's severe enough damage, it can result in tube feeding so nasogastric or PEG tubing for feeds...it sounds like I'm feeding a horse. Andrew: What about something like Barrett's oesophagus? That's a precancerous condition. Is there that risk? Nicole: I believe that there is a higher incidence of Barrett's oesophagus in EoE. But I also think that...oh, gosh. I don't want to say the wrong thing, but I feel like I remember reading an article saying that there is a higher diagnosis of EoE in people who have actually presented for Barrett's oesophagus. Nicole: But it's maybe been misdiagnosed earlier, yeah? Andrew: Yep. Now, I've got to say something that we didn't mention before, but you and I were speaking off air about this, and that is about the biopsy, the issues with biopsy. Andrew: Yeah. Can we just mention that for our listeners? Nicole: That's a really big one. Okay, so in a nutshell, the biopsy is the only way of diagnosing and often to see if the treatment is working the clinician or the specialist will recommend biopsying, then trying a medication, then biopsy again about six months later. And the issue with that is that the eosinophils cluster in the esophagus. So, you may take a biopsy and get a diagnosis of no EoE, "This is totally clear. It's fine." And then you might do biopsy 2 centimeters away and get a severe case of EoE. So, this diagnostic technique is very flawed. Because you're not really getting an accurate indication of, A) how bad the EoE is and, B) whether or not the medication or food elimination intervention is working. Because it's really all going to depend on where exactly you take that biopsy from. Nicole: And although eosinophils cluster and can cause white plaques in the oesophagus, they've actually proven the white plaques aren't necessarily the highest level of where the eosinophils are. And those white plaques may not actually have high levels, or over the 15 per high-power field. Nicole: So it's just fraught with... Misdiagnosis written all over it. Or underdiagnosis written all over it. So it's really tricky, and a lot of the research is looking into less invasive, more accurate diagnostic techniques. Andrew: Gotcha. So where can practitioners learn more about this? Indeed I have to ask you to please publicise something that you did in the NHAA Journal, Nicole? Nicole: Oh, that was a few years ago. I wrote an article about the inflammatory mechanisms in EoE. And I was looking at the herbal anti-inflammatory mechanisms that may match...so I was really just looking at the inflammatory mechanisms and seeing which of our herbs may work. So I think that was in 2013 it was published in NHAA? But having said that, I would really like to make sure I caution people that that doesn't...I actually don't use those herbs necessarily in people. Because I wouldn't use ethanolic extracts. You know, there's lots of reasons why people might react to those herbs. So it was more of a, "Hmm, I wonder if this would work," and without sort of having a lot of opportunity to be safe around those trials, I wouldn't sort of recommend that people go out and use those herbs that I mentioned in the article. Andrew: Yes. Yeah, that’s fine. Nicole: I’m putting a lot of disclaimers in this story. Andrew: Well, I think it's good for appropriate treatment though. I think something that is so...I mean this is truly a personalised program. You cannot expect any form of protocol. I hate that word, but particularly to do with the natural medicines. I can't stand it. Guidelines maybe. But protocols, no. But, given your interest in it and you mentioned the Cincinnati Children's Hospital, are there any other centres perhaps in Australia that are interested in this, doing any research? Nicole: The RPAH in Sydney has done some research into EoE. I know of a couple of other PhD students; I don't know them personally but I have seen a little bit of research in Australia, but it's not a big research field in Australia. And my research that I'm doing, my Master's project on at the moment, I'm looking more qualitative research. So it is mixed methods but I'm really looking at how it's impacting families, what kind of complementary medicine people are using for EoE. Because I know that there are people using it but no one's actually done that research. Nicole: So, I'm trying to find out what people are using and also I'm looking at satisfaction with care. And I’m seeing, because of the feedback I get, people with this disease are really loving the empathy and the care that they get from the complementary medicine practitioners. And it's a really nice thing for our profession. But now we all need to understand the disease more so that we can offer that level of health. Nicole: And, look, we're not going to fix everyone. We're not going to be experts because, gosh, little is known about it. But if it means that someone who's distressed and sitting in your clinic just needs to be told that you believe them and you are listening to them and you care for them, you'd be surprised how far that goes. Because even when you can't actually give something, just giving that empathy makes such a huge, huge difference. Andrew: Well, it sounds flippant but I'm actually saying this seriously. Just giving that empathy might be able to mitigate the mothers, Hashimoto's, if there's a preponderance for that. Nicole: Yes. I sort of I think that, yeah, that is not a crazy thing to say. I think that the impact this has on the families and caregivers is huge. And we didn't touch on that in this discussion, but I guess many of my friends and family and fellow students, you know that I've studied with would probably be like, "Oh, yes, we've heard all about that." Because it's a crazy hard, you know, a few years of just awful, awful being a parent and not being able to help your child when they're in a really bad way. And not having any solutions is very, very tough. Massive sleep deprivation. Big stress financially. You know, there's a lot to it. It's more than just symptoms and trying to give a pill or a herb. It's about trying to look after everyone in the family and make sure everyone's functioning on all cylinders, to be able to cook good meals for the rest of the family, and get enough sleep, and you know, look after themselves as well as the child who's affected. And I do talk about children a lot with this but I do work with adults as well. I just, I guess my heart is with the children because my daughter's still quite little. Andrew: I'm glad that sufferers of EoE will be able to access some FX Medicine podcasts and get, if nothing else, definitely some empathy from you, but some information to be able to go and search further and get some answers from the appropriate specialists in that area. So, Nicole Hannan, I thank you dearly from my heart for taking our listeners and indeed me through the complex issues of EoE today. Thank you very much. Nicole: You're so welcome. Thank you very much for having me. Wonderful to get this message out. Can you assist with EoE Research? As EoE is a rare but emerging disease recruiting participants who are not members of online support groups can be challenging. Your assistance in passing on this information to any potential participants would be greatly appreciated. socially isolated due to their food restrictions. This research aims to identify what types of medicines and therapies are being used for the treatment of paediatric EoE, to gain further understanding as to why they are being used and who is recommending them; and to obtain insight into parents’ perspectives of the physical and emotional impact of paediatric EoE on patients and their families. The results will highlight areas in which additional support may be needed to improve the management of paediatric EoE and support EoE families. They will be asked to complete an online survey (approximately 25 mins duration). Questions will explore quality of life and experiences in the healthcare system for paediatric EoE. Survey participants will be given an option to go into the draw to win one of five $50 gift vouchers. The researchers involved in this project "Exploring healthcare use, burden of disease and satisfaction with care in paediatric eosinophilic oesophagitis" are from Griffith University. Ethics approval has been obtained from the Griffith University Human Research Ethics Committee (GU Ref No: 2018/120).